After Harvey, Most Houston Hospitals Up And Running : Shots - Health News In the past few days, Southeast Texas' catastrophic medical operations center has faced challenges like it has never seen before in keeping the health care system functioning. 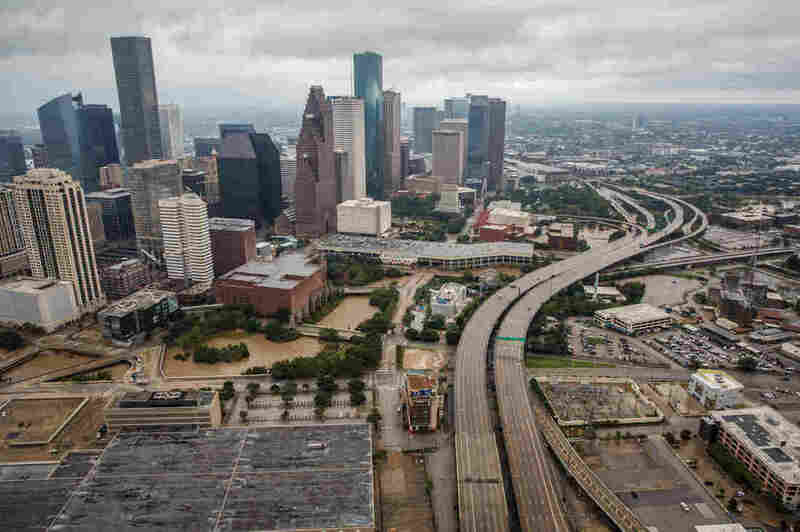 Parts of Houston remain flooded, but most hospitals are up and running, according to Darrell Pile, CEO of the Southeast Texas Regional Advisory Council, which manages the catastrophic medical operations center in Houston. A catastrophic medical operations center, housed within Houston's emergency center, has been coordinating with hospitals throughout the storm and continues to field calls about patients needing evacuation or immediate medical attention. All Things Considered host Kelly McEvers spoke with Darrell Pile, CEO of the Southeast Texas Regional Advisory Council, which runs the catastrophic medical operations center. While the storm has largely left Houston, the flooding continues. What is the situation with the hospitals you're working with? The flooding is devastating, and we have at least two reservoirs where water is having to be released and is, in fact, flooding neighborhoods as we speak and has placed three hospitals in harm's way. The three hospitals are monitoring the water coming from the two reservoirs very closely, and they could, depending on the flow of the water, find that they could become inaccessible to EMS agencies. We are tracking that very closely. The situation with residents in their homes — some are on the second floor of their homes — the evacuation process [for those neighborhoods] continues, and, as a result, it's unclear what the demands on the health care system may be. However, most hospitals are up and fully functional, and we believe we can handle any new demands that happen today or tomorrow. Has the catastrophic medical operations center ever handled anything like this? No. The phone lines at one point became inundated. The amount of resources needed began to exceed what we had available. The calls included patients needing dialysis who might be at home. It included hospitals saying we need to evacuate. One call was asking for 50 wheelchairs to be sent to a shelter. We didn't have 50 wheelchairs left. Fortunately, our governor declared a disaster and the president declared a disaster and resources have been brought in from all over the state and all over the nation to help us. How did you get those 50 wheelchairs? I'm not clear on how they ended up getting the 50 wheelchairs, but I can tell you, it can be accomplished just through one or two tweets to Houstonians. Those with wheelchairs perhaps in their attic or stored [elsewhere] could bring an abundance of wheelchairs, perhaps more than you even need. So there are methods to solve every problem. It's just having enough people to make the calls or to be innovative and creative to solve the problems. This community has come to the call. A number of hospitals did evacuate, either prior to the storm or during. How difficult is it to evacuate a hospital? It's not as simple as pulling up a bus or a convoy of ambulances and moving patients from one hospital to another hospital. My organization makes sure that the receiving hospital meets the need of every single patient they agree to receive. As a result, the evacuation of a hospital might mean we must identify 10 different hospitals to meet the unique needs of each patient. Every day, three times per day, we have hospitals electronically advise us of beds that they have available and the type. So a pediatric patient goes to a pediatric bed. And we've also spent time making sure the receiving hospital is not in harm's way so that the patient would not have to be evacuated twice. We have worked with the [Texas] Department of State Health Services to also identify hospitals with beds available in cities such as Dallas or San Antonio or Austin or even further away so that a patient doesn't move twice. We've heard news of at least one hospital being short of food. Has that been resolved? Yes. I was intimately involved in the Ben Taub [Hospital] decision to evacuate, and I was aware of their call for food. It was not a problem that was devastating or affecting patient care to any significant extent, and it did not last throughout the disaster period. We do have to deal with situations where we have to dig down and find out the truth and make sure our response is responding to facts and not to stories that might have had some facts at one point, but as days went by, it became a little distorted. A number of Houston hospitals added flood protections as a result of other devastating storms, including Allison in 2001. Have those worked? Absolutely. We had a situation where in prior storms, water came into a tunnel system that connects the Texas Medical Center hospitals. [The tunnels] make it easier to go from one hospital to another hospital. However, waters came in and flooded every hospital through that tunnel system. The Texas Medical Center invested in submarine-type doorways, and when there is a risk of flooding, they now close those doorways. So each hospital is compartmentalized. As a result, this storm — even though flooding devastated our community, it did not devastate Texas Medical Center. So, congratulations to the Texas Medical Center. Do the hospitals have the staff they need right now? I can imagine some of the hospitals have fewer employees available to staff the hospital. Some members of their workforce have lost everything — their homes destroyed, their automobiles destroyed. Tomorrow, we will be holding a meeting to discuss what do our hospitals need. And from there we will be identifying where we need to place nurses. We have an abundance of nurses from throughout Texas who have offered to help. We also have an abundance of physicians who have offered to help. Now it's a matter of making sure we place them in the proper facilities.